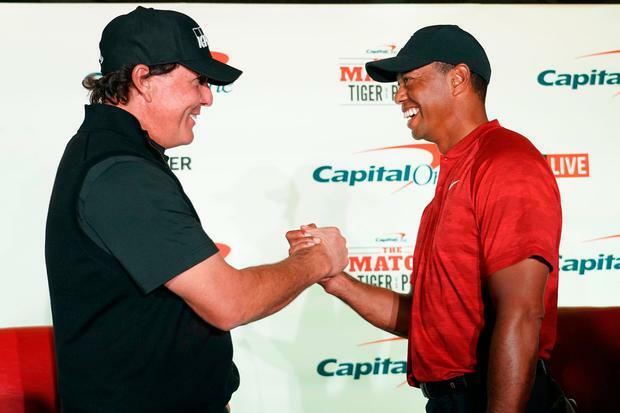 Tiger Woods and Phil Mickelson believe their $9 million Las Vegas showdown is good for golf. But while many believe tonight's winner-takes-all cash grab embodies everything that's wrong with the game - the publicity shots of them posing in front of a mountain of cash have been described as offensive at best - they may have a point. In an era when the likes of Justin Rose can afford to turn up his nose at events like the recent $8 million DP World Tour Championship, golf may need more than the biennial ego-fuelled Ryder Cup to engage viewers. "It's a rare insight into our sport, and I think people will want more of this in the future," Mickelson said. "If people don't like it, then it's probably going to be one-and-done, but I think it will go down well." Watching players with big egos 'miked-up' for a money match has its fascination, especially with a $200,000 side bet riding on Mickelson making birdie at the first. With the US preparing to embrace sports gambling outside Las Vegas, golf wants to cash in and protect its brand at the same time. "We've decided it's going to lead to more fan engagement opportunities and that's an opportunity to grow your business, grow your fan base," PGA Tour commissioner Jay Monahan said. "If it's regulated at the state level, we think it's better to be a participant than to be on the sidelines." In the tale of the tape, Woods has already crushed Mickelson - 14-5 in Majors, 80-43 in PGA tour wins, $115.5-$88.3m in career earnings. But when it comes to who's the best hustler, the jury is out. "If you want to be a professional golfer out here, really you've got to ultimately learn to hustle a bit," Pádraig Harrington said of the lost art of hustling in 2016. "That's kind of missing in golf nowadays. Everything is ordered. It's all academies and things like that." Meanwhile, Leona Maguire played just five holes before heavy rain forced play to be suspended in the Andalucía Costa del Sol Open de España at La Quinta Golf & Country Club in Marbella. The Slieve Russell star (23) is tied for ninth on one-under par, two shots behind clubhouse leaders Michele Thomson and the Netherlands' Anne van Dam, who shot three-under 68s. Maguire almost holed her 75-yard approach for an eagle three at the fifth. However, after tapping in for birdie to move into the red, she didn't get to take her 12-footer for birdie at the sixth. "There was a stream running down the green!" she reported. In Turkey, Tulfarris Resort's Simon Thornton is just one stroke off the lead heading into the final round of the PGA Playoffs at Antalya Golf Club's PGA Sultan Course. English duo Matthew Cort and David Dixon lead on five-under-par, with Thornton tied for third with Scotland's Alastair Forsythe after a second round 69. Waterville's David Higgins shot a three-over 74 to share 10th on level-par. Michael McGeady is tied 17th on two-over after a 72 in an event where the top three will earn automatic spots on next year's GB&I PGA Cup team. The top two qualify for the 2019 British Masters while the first four get spots in next the BMW PGA Championship at Wentworth next September. In Greece, Ireland's Damian Mooney, Headfort's Joe Dillon and Glasson's Colm Moriarty are tied for eighth, nine shots behind Germany, heading into the final round of the International Team Championship at Costa Navarino. Mooney shot 72 and Moriarty a 70 in a level-par third-round 142, leaving Ireland on five-over par. At the European Tour's Honma Hong Kong Open, England's Aaron Rai, Australian Jason Scrivener and Japan's Yusaku Miyazato opened with five-under 65s to lead by a shot from Jack Singh Brar and American Micah Shin. Tommy Fleetwood shot a one-under 69, but Masters champion Patrick Reed struggled to a five-over 75.